If you want to know everything about the FIFA 19 Ones to Watch Winter Edition, you need to read this guide. Here you will find the release dates, the official rules, a prediction and the final squad. What do you expect from the FIFA 19 Ones to Watch Winter Edition? Brand new LIVE items for the top winter transfers from across the world are available for nine days. Each FIFA 19 OTW Winter Edition player will have a dynamic rating that will increase based on their latest Team of The Week, Man of the Match, European Team of the Tournament, Hero or Record Breaker In-Forms. Take advantage of special Weekly Objectives during this period for a chance at a Ones to Watch item. 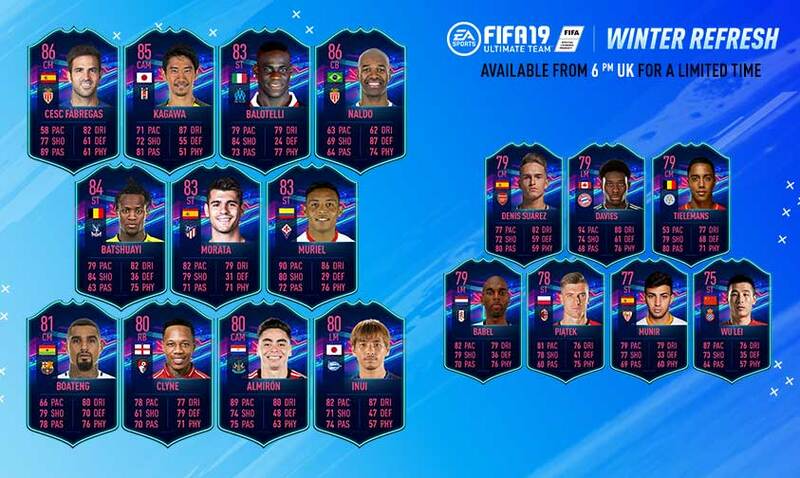 Based on the FIFA 19 Winter transfers, that you can check here, 18 players will be released in new dynamic cards, replacing their regular cards in packs for a limited time. How the FIFA 19 Ones to Watch Winter Edition Works? The 18 players selected for the FIFA 19 Ones to Watch Winter Edition must be some of the most promising players who have been permanently transferred between clubs in the most recent Winter transfer window and are also under the age of 30. 2.1. The rating will match the highest TOTW, MOTM, ETOT, Hero or Record Breaker card or, if it doesn’t exist, the regular card. 2.2. Ones to Watch cards are not affected by TOTS, Ultimate Scream, FUT Birthday, POTM, POTY and TOTY cards. 2.3. The ratings of OTW cards are automatically updated as soon as a new card mentioned on 2.1 gets released. 2.4. The ratings update automatically, whether they are in your Club or listed on the Transfer Market. 2.5. The TOTW, MOTM, ETOT, Hero or Record Breaker cards a player received on his old club don’t affect the rating and the stats of his OTW card. If an OTW player is transferred/loaned to a different club, the type attributes and latest TOTW in-form rating will be unaffected. However, his OTW player item type will remain at the players previous club until he gets a TOTW, MOTM, ETOT, Hero or Record Breaker in-form at which point the player’s club, crest and a dynamic image will be updated. 3.1. If an OTW player is transferred/loaned to a club not in FIFA 19, the card will remain at the club he was previously at and he will not receive any further TOTW, MOTM, ETOT, Hero or Record Breaker cards. His Ones To Watch item type will continue to carry the last special rating he received. 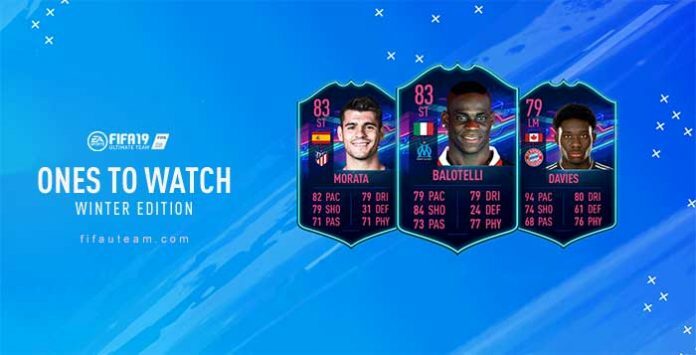 If a Ones To Watch Player’s TOTW, MOTM, ETOT, Hero or Record Breaker in-form is in a different position to their Ones To Watch item, the OTW will keep unchanged. He will, however, continue to receive any attribute upgrades from that and future in-forms. When the FIFA 19 Ones to Watch Winter Edition will be available? Which players will make part of the FIFA 19 Ones to Watch Winter Edition? 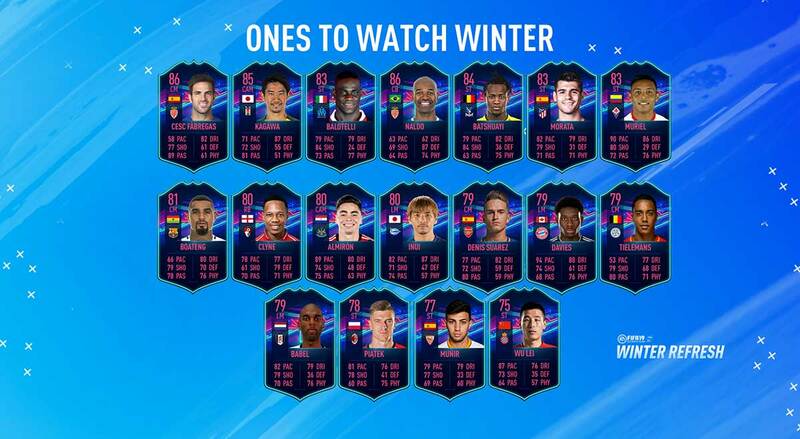 The FIFA 19 Ones to Watch Winter Edition cards will be available from February 15 to February 24. During these days, it is not possible to find the regular cards of this player’s selection because the OTW cards are replacing them. Q: What makes FIFA 19 Ones to Watch special? A: The Ones to Watch items dynamically upgrade and have an opportunity to increase in ratings throughout the season. If you have a Ones to Watch item in your club, its ratings will automatically match that of the players latest Team of the Week, Man of the Match, European Team of the Tournament, Hero or Record Breaker In-Forms. The better the player performs in real life, the higher their ratings become! A: The items get automatically updated when a new Team of the Week, Man of the Match, European Team of the Tournament, Hero or Record Breaker is released, provided that the player is included. Q: What happens if a Ones To Watch Player changes nationality? A: The Ones To Watch Player Item will be updated with the new nationality as soon as possible. Q: What happens if a Ones To Watch Player is transferred/loaned to a club not in FUT 19? A: The Ones To Watch Player Item type will remain at the club he was previously at and he will not receive any further in-forms. His Ones To Watch Item type will continue to carry the last applicable in-form rating he received. Q: What is the criteria for picking FIFA 19 Ones to Watch players? A: Ones to Watch players consist of a curated selection of the highest profile and most promising players who have been permanently transferred or on full season loans between clubs in the most recent Winter transfer window and are also age 30 or under. A: If you have a Ones to Watch item in your club, its ratings will automatically match that of the players latest applicable In-Form until the end of that player’s domestic league season. At this point, the player’s Ones To Watch Item type will continue to carry the last in-form rating he received through FUT18. Q: What happens if a Ones To Watch Player’s in-form is in a different position to their Ones To Watch item? A: The player’s position on his Ones To Watch item type will not change. He will, however, continue to receive any attribute upgrades from that and future applicable in-forms. Which player do you receive if you complete the OTW weekly objective? I believe it is a random player. Gelson Martins already has a summer OTW, which was obtainable if you completed the weekly objective. EA could still put him in the winter OTW, since this item was just an objective! That was not their opinion. For them, he already has an OTW item. Not in OTW but we know he will be introduced soon in the game. Sorry, but I have no idea. Anyone here can help Leonardo, please? Could you tell me why you think winter otws will still come after headliners and why you think it will be released on the 8th. Hi. There is nothing confirmed about OTW Winter Edition right now. We don’t know when it will be released and even if it will be. It has been released every single year and since Headliners has nothing to do with the OTW event, we still believe they will release it. Batshuayi already has an 84 rated IF, you gave his winter OTW an 81 rating.